As a nonprofit professional, you’re probably well-versed in fundraising best practices. But how much do you know about mobile fundraising? It’s a broad and pretty all-encompassing term that spans from text-to-give to mobile email and beyond. And, luckily, it can easily be incorporated into your nonprofit’s existing donation efforts, such as crowdfunding campaigns and giving days. How, you ask? That’s where this article comes in! Get your text-to-give game on point. Optimize your emails for mobile. Turn your online donation form mobile-friendly. 1. Get your text-to-give game on point. Once upon a time, large nonprofits were the only ones who had access to text-to-give technology. Luckily, next generation text-to-give platforms have broken down these barriers, and now text-to-give is one of the top ways that nonprofits of all sizes fundraise on the go. Presto! They’ve just given to your organization with two clicks! Because this technology capitalizes on the fact that nearly everyone has a smartphone, it allows donors to give anywhere, anytime. As a result, text-to-give is easily combined with other fundraising strategies to offer supporters even more ways to get involved. On giving days, for example, text-to-give becomes a powerful tool to enable people to donate from wherever they happen to be. They no longer have to go out of their way to mail off a check or to find a computer screen in order to support your cause during your giving day! Some added bonuses? 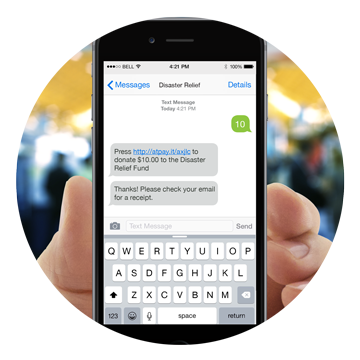 Text-to-give software is easily integrated with other fundraising technology, including nonprofit CRM software, allowing seamless data collection and transfer. Additionally, there’s no cap on how many donations you can receive through this method. Donors are able to text-to-give as many times as they please, so tell your supporters to text away! Takeaway: Text-to-give is an easy, effective, and efficient way for your donors to give on the go. 2. Optimize your emails for mobile. But have you truly optimized your email in order to reach the most mobile donors? Ensure that your emails load appropriately on mobile. Your mobile donors shouldn’t be pinching, zooming, and scrunching to try to read your great content. Eliminate excessive text blocks. You only have a few seconds to grab the attention of your donors. Use those seconds wisely by providing only the most pertinent information about your fundraiser. Make your pictures meaningful. A picture really is worth 1,000 words, and donors process images twice as quickly as they do words. Choose an image that really speaks to your organization’s mission, and you’re bound to have twice as much success. Include a mobile email fundraising button. One of the issues with email fundraising is that donors have to click out of an email and onto a separate donation page in order to give. Mobile email fundraising buttons get rid of that hassle by allowing donors to give directly through the email you sent. Once you’ve turned your emails mobile-friendly, you can harness them to make the most of your ongoing fundraising efforts. Organizing a day of giving, for example, requires you to send a barrage of announcements and calls-to-action leading up to the event. If your email outreach isn’t mobile-optimized, some of your supporters will miss the message — and your nonprofit will miss out on their donations! As another example, crowdfunding campaigns depend heavily on periodic updates to encourage people to donate. In fact, Fundly estimates that crowdfunding campaigns that regularly post updates raise 126% more funds on average. It’s vital, therefore, that your supporters are able to access easily-readable email updates about your campaign on whatever device they use. Plus, adding an in-email donation option makes it that much easier to get involved. Takeaway: Rethink the way your organization does email by optimizing for mobile and adding in-email buttons that allow donors to give instantaneously. 3. Turn your online donation page mobile-friendly. 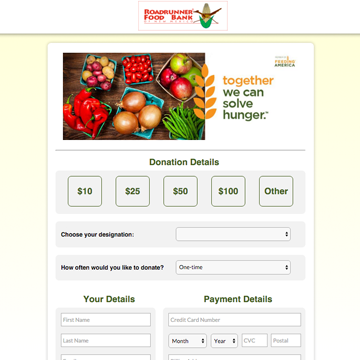 Chances are, your nonprofit already has an online donation page. Upgrading your portal to be mobile-responsive. Reducing the number of required fields. Making sure your branding is consistent. Increasing the size of your buttons and text. If your online donation form includes other, more specialized features, you’ll want to ensure that they too function properly when viewed on a mobile screen. For example, if your page includes a searchable plugin to encourage matching gifts during the donation process, make sure that plugin works correctly (and displays mobile-friendly results!) regardless of the device used. Kept their required fields to a minimum (by only asking for what’s truly necessary). Provided a wide variety of giving options (as well as a chance to choose “Other”). Included branding from their color scheme to their heading banner. Made a very clear call to action. If you follow these best practices, your nonprofit’s mobile donation page could help propel your organization to new heights. This becomes especially useful during live fundraising events and giving days. Let your supporters know that they can access the donation page right from their phones or tablets. You’ll begin to see the benefits of such mobile-friendly donation pages almost immediately! Additionally, you can take these lessons and apply them to your crowdfunding pages as well. Since you’ll want to meet donors wherever they are, make sure that your crowdfunding campaign’s page is mobile-responsive. This offers your supporters every possible way to give to your cause — and makes it easy for them to do so. Takeaway: With so many people finding your organization’s donation page on their mobile devices, it’s about time to upgrade your existing page to be mobile-friendly. It’s been said many times before, and it will likely be said many more times, but social media is everywhere. It’s one of the most pervasive (and persuasive) forms of media in the modern world! Facebook is the most downloaded app on the mobile app store, and not far behind it are Twitter, Instagram, and Snapchat. What does all of this mean for your nonprofit? It means that social fundraising needs to become a part of your nonprofit’s overall strategy if you want to reach your donors where they are. How can your organization take advantage of the various social media sites to boost mobile fundraising? Facebook — Post pictures that exemplify your mobile fundraising campaign. Keep your words to a minimum, and don’t forget to include obvious calls-to-action. Twitter — Hashtag your posts to get your content in front of a wider audience. Provide a link within your 140 allotted characters to make it easy for your followers to learn more about your cause and to donate on the go. Instagram — Keep your content relevant, exciting, and mission-oriented. Post a link to your mobile donation page in your Instagram bio, and don’t forget to let your followers know it’s there with every post you make! Snapchat — Give your followers minute-by-minute updates on your fundraising progress with video “stories.” Entertain donors while educating them about the efficacy of your organization’s fundraiser. Social media also provides a great avenue to publicize your fundraising efforts. Many supporters check their Facebook or Twitter accounts more than they do their email accounts, so make sure you’re marketing your events via those platforms as well! Let your supporters know about your upcoming giving day or crowdfunding event by posting a “countdown to giving” each day. Invite donors to like and share your posts with their friends or followers, giving your campaign a broader reach. Post updates (with pictures) throughout to encourage more giving. Another great tip: many types of crowdfunding platforms come standard with social media sharing buttons — put them to good use! Takeaway: To stay current with modern fundraising practices, your organization should get on board with social media and the giving opportunities it now provides. The bottom line is that your nonprofit already has all of the necessary tools in your fundraising toolkit. In order to make the most of these tools and get your mobile fundraising efforts off the ground, all your nonprofit needs to do is to give each tool a little tune-up. From adding text-to-give technology to your belt to upgrading your existing email and online donation pages, making your efforts more mobile-friendly is simple, swift, and sure to lead to success.